Bee orchid for sale – Easy plant to grow, grown for the ornamental flowers, planting season in autumn to spring, better to buy bulbs, plant or another option to start from seeds yet more challenging. 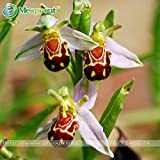 Growing information: perennial plant, growing hardiness zone: 6-11, but also grown as house plant, water needed – small to average amount, light conditions – full sun to full shade with light, height: 10-50 cm, 4-20 inches. Blooming in the winter to spring in female bee shaped flowers that appear in color that can be: the 3 sepals can be: white, purple, green, yellow or pink, the lip color can be: black, purple, red, blue, pink, white, orange, yellow, brown or green, the flower can be in more than one color it can be stripes, dots or shapeless. 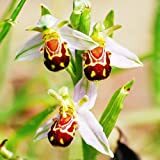 Bee orchid for sale – What need to know before buying Bee orchid? 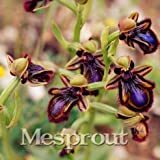 Is it recommend to buy: seed, bulb or plants? 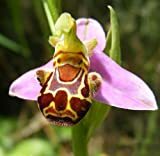 Bee orchid – orchid flower that grow in open grassland, before buying need to check that you can provide the condition of plant: alkaline soil, well-drained soil. Bulb its most recommend to buy, seeds are like dust hard to manage, when it’s plant with green leaves it’s not the season, and the bulb in the season it’s the easiest way to put it in the ground with high rate of success.